I found this a wandering narrative about a family without a real direction. It might be of interest to those of the racing fraternity but a numbing ramble to most readers. Sorry Mark. A very inventive, interestingly written book, but I can't say that I really enjoyed it. It would go from the past to the present in a matter of chapters, almost, which I found a bit confusing & rather annoying. It took me awhile to figure out the reading of ths novel. I just didnt get it for a while, but once I adapted to the style I fell in love with it, and with the brothers it wove the tale around. It strikes right to the heart and the characters glow with authenticity. 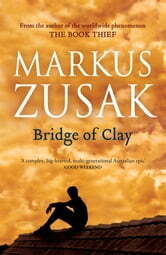 Thank you Markus Zusak for my best read of the year. This book is a wonderful story to read will so much feeling and love, But it is hard not to shed a few tears.